Are equity expectations (e.g., historical volatility, implied volatility, calendar events) a critical part of the conversation for a RadioActive Trading married put? The RPM / Married Put is a bullish strategy. We need the stock to rise to realize a profit. I know you realize this, but I just wanted to reiterate that. It helps to have 11 different income methods that we can use if the stock moves up, stagnates or even declines in price, but I want to have a stock move up 5% or so in the first 30 days. Am I always right? Of course not, which is why I prefer to use the put to mitigate risk in case I am wrong, or in some cases really wrong. The reason why we do not talk about this, or these specific criteria, in The Blueprint is that every investor has their own method of analyzing stock and analyzing stock charts to identify a bullish stock. The method we teach in the Blueprint isn’t an exacting, trade-by-numbers procedure. We teach the theory of the married put and the theory of the income method trades. We show REAL examples of them traded over the years, we offer tools to help you find both the married puts and the income method trades. The expectation is that the reader will understand and assimilate the material into their own trading strategy. If you look to volatility numbers like historical volatility and implied volatility and upcoming announcements for the stock to make better stock selections, then those would still hold true for your married put trading. Do anything you can to get a good stock! One that won’t go down. In fact, do anything you can to find a stock that will go up! We do offer some ideas and guidelines in the Blueprint, but not a strict formula with strict adherence required. Do I personally use implied volatility when looking for my new married puts? Nope. I have been trading these techniques long enough to know the positions that would match my criteria all have a tight range of implied volatility, just like they have a tight delta range . If the implied volatility was too low the RPM would not match my criteria. If the implied volatility was too high, the married put would have an at risk amount beyond my personal threshold, so I would not even see it in my Search results on PowerOptions. I do use historical volatility occasionally, mainly just to filter out stocks that have an historical volatility less than .20 (20%) or .25 (25%). I want to see some movement in the stock. That being said, if I chose to enter into a dividend stock like the current position in Johnson and Johnson, JNJ, I may have to lower that requirement. I also do not use calendar events when opening an RPM. I perform my due diligence to know when the next earnings and ex-dividend date are before opening a position, or if there are any news items or headlines that might cause me hesitation from entering a position, but I do not screen or specifically filter for that. I have my own set of criteria where I look for stocks that have shown good growth in earnings over the year, have a reasonable P/E ratio, match my ‘maximum at-risk’ amounts, are within my desired strike price range and match some technical criteria. 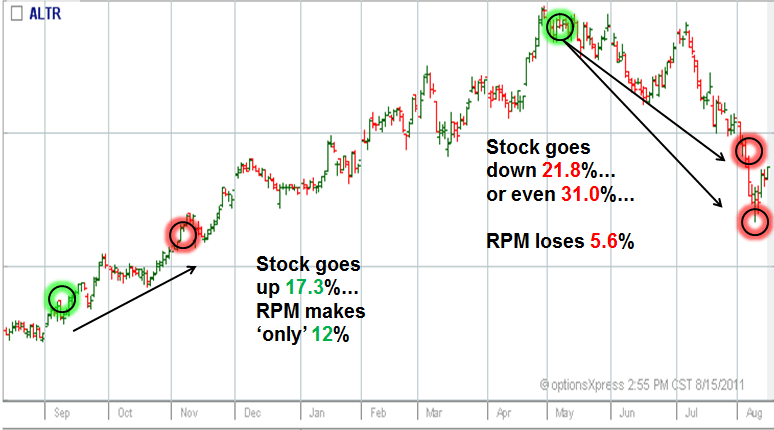 Your homework… Think this stock might be a good candidate for an RPM? Hi Dave: Yes, we did end up entering the DNKN position on 6/26/2013. So far we haven’t made any adjustments. This trade and all of the RPMs that we trade are available in real-time for subscribers to our FUSION service. Happy trading to you, let us know if we can help you further. “Think this is a good candidate for an RPM”?